This #1 bestselling daily devotional, Jesus Calling, has impacted over 25 million lives with words of encouragement, comfort, and reassurance of Jesus’ unending peace and love. 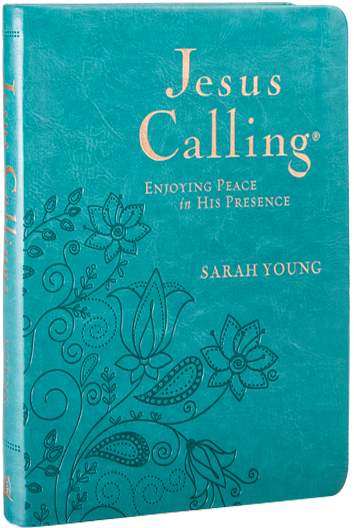 Sarah Young shares her personal prayer journal and her reflections based on Jesus’ words of hope, guidance, and peace within Scripture. Penned by one who loves Jesus and reveres His Word, these writings will help your love for Jesus grow as you spend time with Him each day. Sarah Young has also added 100 new scriptures to this beloved book. And the scripture and references are completely written out at the end of each devotion. Easy-to-read, comfort print is found inside this deluxe leathersoft edition. Also includes written-out Scripture verses.